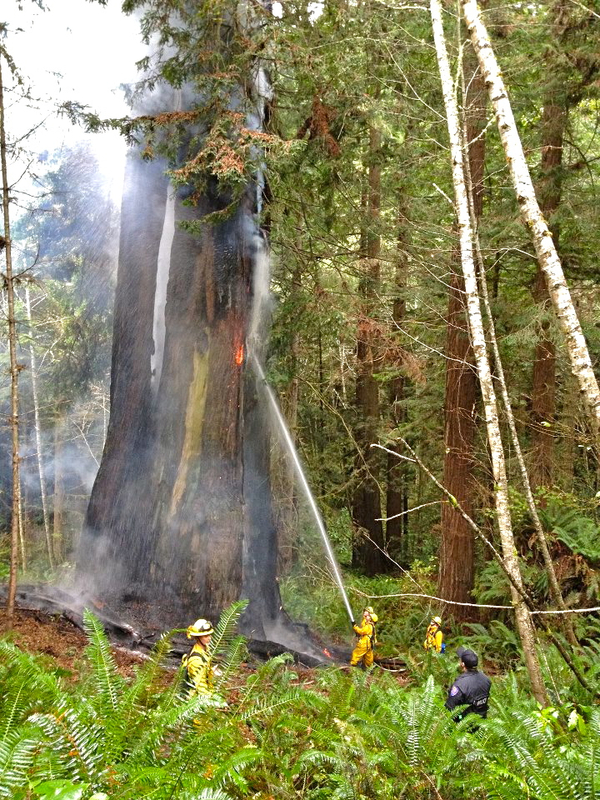 On Saturday, Dec. 15 at about 10:32 a.m., officers from the Arcata Police Department and two engine crews from the Arcata Fire Department were dispatched to the Arcata Community Forest on a report of a tree on fire. 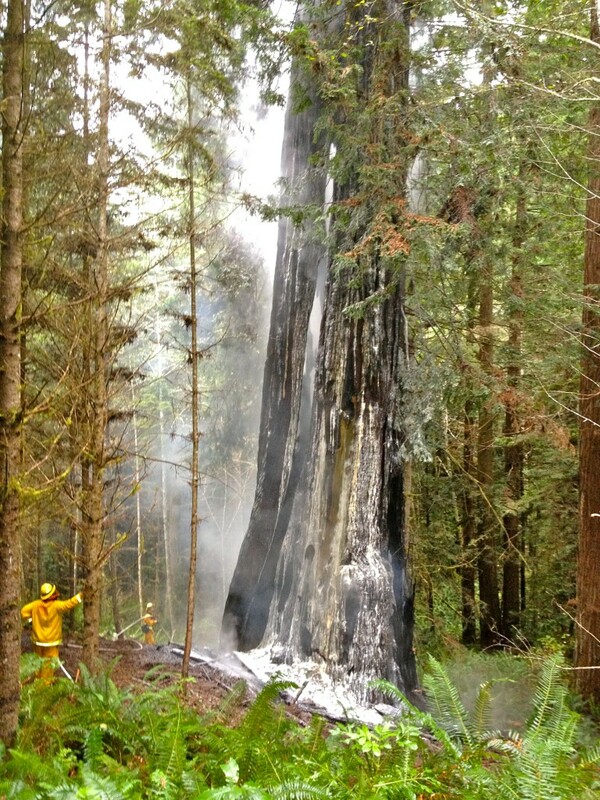 On arrival firefighters and officers discovered an old-growth redwood with active fire extending about 70 feet up the tree. The tree, estimated to be about 15 feet in diameter at the base, had likely been on fire for up to 24 hours, based on the extension of fire throughout the tree. Firefighters used 2,500 gallons of water in battling the blaze but due to the height of the active fire in the tree were not able to fully extinguish the fire. Due to the extensive damage to the tree the precise cause of the fire is undetermined. Based on the high moisture level of the surrounding area and recent weather patterns it is believed this was not a naturally occurring fire. The “goosepen” area of this tree, an interior area of the tree hollowed out by prior naturally occurring fires, has been the site of illegal campers in the past. It is believed that this fire was caused by an illegal warming fire started by campers seeking shelter. In the interest of public safety, Trail 15 is closed until further notice. Staff from the City of Arcata Department of Environmental Services will monitor the tree and surrounding area and determine when the area is again safe for the public. 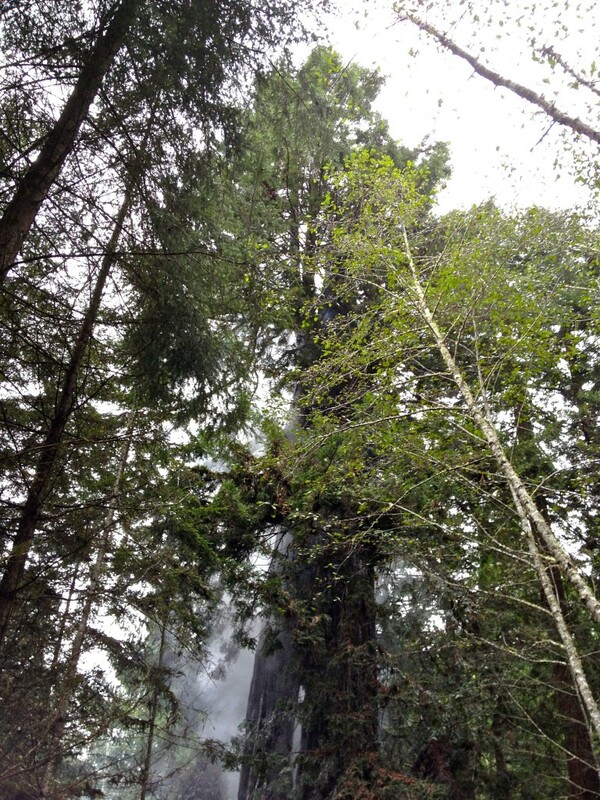 The Arcata Police Department reminds all residents and visitors that the Arcata Community Forest is a resource preserved for the enjoyment of all. Fire is always a danger, even in wet weather. For the protection of the forest, fires and camping are strictly prohibited. If you observe any campers or fires in the Arcata Community Forest, Sunny Brae Forest, Jacoby Creek Forest, the Arcata Marsh or any other natural areas in Arcata, contact the Arcata Police Department at (707) 822-2428. Update: Environmental Services Director Mark Andre said Treebeard’s age is difficult to determine, as it is hollow. But he estimated that it is 500 to 800 years old. Andre said that the rain-dampened tree and surrounding forest will “probably be OK,” but that burning embers continue to waft around in the area, necessitating closure of Trail 15. Smoke rising in the redwoods. This entry was posted on Sunday, December 16th, 2012 at 10:49 am	and is filed under News, Environment. You can follow any responses to this entry through the RSS 2.0 feed.